One of the best DSLRs in the market is Nikon D4, which is considered to be one of the fastest and the best professional cameras that have been made particularly for sports photography. It is equipped with a new Nikon FX-format CMOS image sensor coupled with EXPEED 3 image processing engine for optimization of images. It has an effective pixel count of 16.2-million pixels, and offers superior image quality under a broad range of lighting conditions with its image sensor supporting an incredible range of sensitivities from ISO 50 to ISO 204800. It comes with 51-point AF system with enhanced performance in subject acquisition and focusing in low-light situations. It features "Sub-selector" for horizontal shooting and "Multi selector for vertical shooting", which are new features added for efficient operation. Besides these, it comes with several new and amazing features that enhance the photography experience. A high performance DSLR, Canon EOS 5D Mark III is counted among the best DSLRs among the professional photographers. It features a 36x24 mm full frame CMOS image sensor with a resolution of 22.3MP, ensure crisp and high quality images. It comes with as 3.2 inch TFT colour LCD display with a 1,040,000 dot resolution as well as supports Compact Flash Card Type I, SD, SDHC or SDXC memory cards. Powered by an LP-E6 rechargeable lithium-ion battery, the Canon 5D Mark III is capable of shooting up to 950 shots. Besides, it includes various other features like PictBridge, Face Detection, self-timer function and the like. The camera has many more features for an enhanced photography experience. Nikon D810 is counted among the best DSLR cameras in India and features a 35.9 x24.0 mm CMOS image sensor with an image resolution of 36.3MP. It comes with FX-format image sensor that delivers strikingly sharp images with consistently wide dynamic range from standard ISO 64 to 12800. It has EXPEED 4 image-processing engine renders high-definition images with enhanced sharpness, rich tonality, accurate color reproduction and carefully controlled noise across all ISO sensitivities. It comes with New Picture Control System, which makes image-tuning more flexible and easier. Its innovative 51-point AF sensor is lightning fast and delivers amazing image quality. Sony is famous all over the world for its amazing cameras and Alpha 7R is another great camera from the company. It features a full-frame sensor with a resolution of 36.4MP. It is a high-end camera with amazing features with Translucent Mirror Technology. It sports a 36 MPCMOS sensor with no optical low-pass filter. It comes with E-mount with support for FE, E, and A-mount lenses. The Bionz X image processor equipped in this camera delivers high-quality images. It has a built-in Multi-Interface hot shoe along with XGA (1024x768) electronic viewfinder. It features 3-inch tilting LCD with 1.23 million dots for viewing of images and videos. Diffraction correction technology, Continuous shooting up to 4 fps, Full HD video recording at 1080/60p and 24p; uncompressed HDMI output, Wi-Fi with NFC capability and downloadable apps are some of the additional features of this DSLR. Sporting a 24 MP CMOS image sensor, Nikon D3200 is among the best DSLRs in India. The image sensor has an ISO Sensitivity of 100 – ISO 6400 with f/3.0 –f/5.6 Aperture. It features a 3-inch TFT LCD screen along with Eye-level Pentamirror viewfinder. 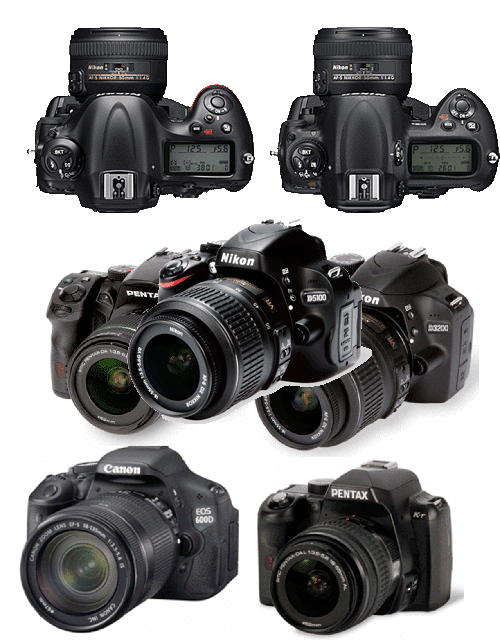 It comes with TTL Phase Detection for improved photography experience. The camera is capable of shooting full HD videos in MOV, MPEG-4 / H.264 formats.